In the past two weeks 75% of the leaves have fallen from one of the trees in the yard, much to our excitement. 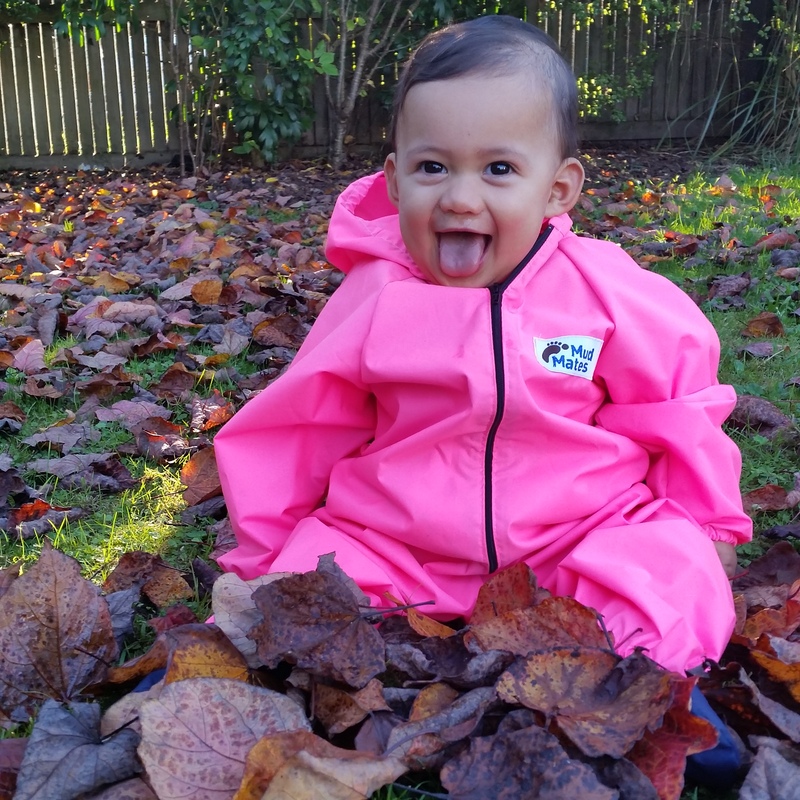 Miss Toddler just loves throwing the leaves around and hearing them crunch. 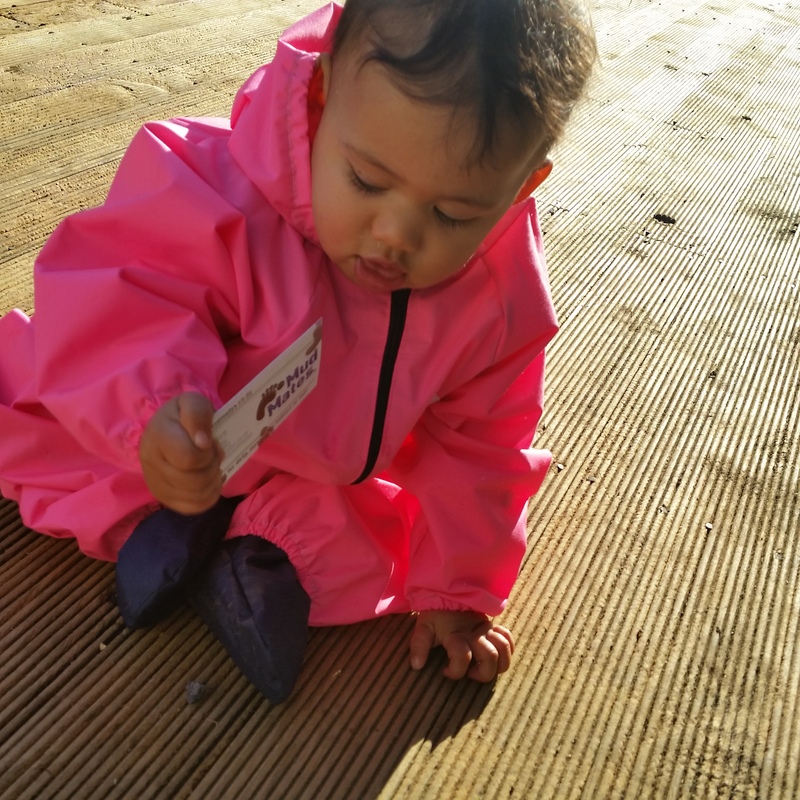 So you can imagine how excited I was to be asked to review the Mud Mates Coveralls for Kiwi Mummy Blogs. A chance for Little Miss to join in on the fun! I checked out the Mud Mates website and Facebook page whilst waiting for the coveralls to arrive, and I was pretty intrigued to see how they would work out. We live rural so there are plenty of muddy, wet, cold, dirty opportunities on our doorstep. The website says they’re water-resistant and water-repellent so they’re super handy for outdoors play and painting. The package arrived, and I have to say, one thing I love about local made products is the care the businesses go to with their packaging. Wrapped in tissue paper, a business card, and a 10% off your next purchase card, sent off with love. Little Miss is 8 months old now (where did that time go?! 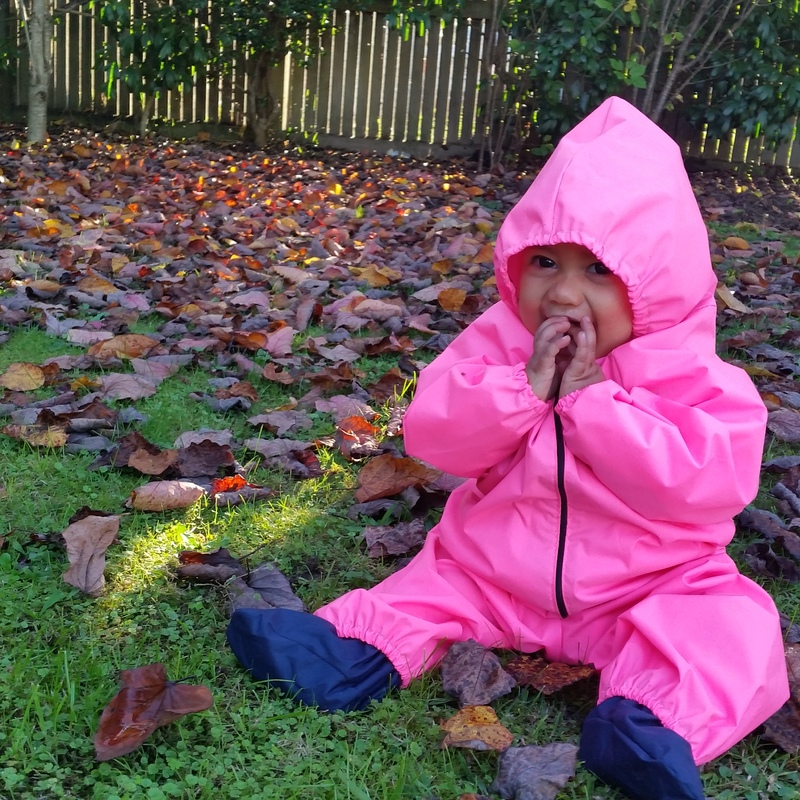 ), so we opted for the Size 1 coveralls in pink, with navy shoe covers. We had thought we would wait for a rainy day to truly test out the water-resistant and water-repellent feature, but the rain hasn’t come! So with a lovely autumn afternoon today, we decided to head outside to play. They’re like a ghost-busters type onesie; the zip comes halfway down the front, with elastic on the ankles and wrists. It was a wee bit of a struggle to get Little Miss into them because she’s been practicing her crocodile roll lately, and refuses to sit still. But we got there! She’s not in shoes yet, but we stuck the shoe covers over her socks – I thought it’d be a good test to see if we had wet socks afterwards! What can I say? They’re super! The grass was wet, the leaves were wet, but Little Miss was dry inside! The pink is extra cute, which I know really shouldn’t matter, but for $45NZD you want to be getting something that looks good as well. The elastic around the wrists and ankles weren’t too tight, but were tight enough that they stayed put when she crawled. You can see how frustrated little ones get when their pants slip down over their feet and their legs are wriggling inside them. She has a fair bit of space to grow into which is great, because the coveralls will last her a while. We tested out the hood of course. When zipped all the way to the top and the hood on her head, her ears are completely covered which is great for windy days. The zip comes right up below the chin meaning they really do a good job of keeping everything inside clean and dry. And the shoe covers are an added bonus. They’re like little water-resistant socks. They’re made of a PVC free polyester fabric with a polyurethane coating on the inside, and a 3M Scotchguard water-repellent coating on the outside. The best part is dirt just wipes off with a damp cloth, and when they’re wet you just hang them straight out to dry. They only need to be machine washed occasionally, which is great because let’s be honest, the less cleaning I have to do the better (cleaning is not one of my strengths). I actually think these coveralls will be great for going to the snow in this year, so much so that I think I’m going to look at getting some for Miss Toddler too! With the amount of space in them, you can pack on the layers underneath and know that the outer layer will keep your kids dry and comfortable. The price is reasonable for what you’re getting, especially considering they’re locally made. I would expect something like this to retail closer to $60NZD quite easily. Overall they receive two thumbs up from me, and a big toothless grin from Little Miss. Disclosure: This post is sponsored by Mud Mates. I received a free sample of the product mentioned. All opinions are my own.